Now in its 34th year, the Ybor City Museum Society has honored more than 70 members of our community with awards that recognize their contributions to the economy, cultural heritage, and history of Ybor City. This year’s award presenters and honorees represent the Spanish, Sicilian, and Cuban immigrant families who contributed extensively to Tampa’s diversity. They are old-line families of up to five generations in Ybor City. Their stories about Ybor traditions and culture go beyond what can be found in the history books. The Ybor City Museum Society (YCMS) has announced the recipients of the 2018 Legacy Awards, who were selected for their significant contributions to the Historic District. 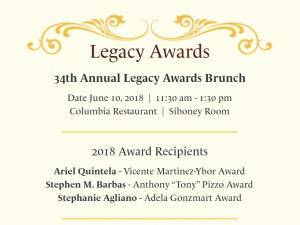 Ariel Quintela (Vicente Martinez-Ybor Award), Stephen M. Barbas (Anthony “Tony” Pizzo Award), and Stephanie Agliano (Adela Gonzmart Award) will be honored at an Ybor-style brunch at the Columbia Restaurant on Sunday, June 10, 2018, 11:30 a.m. -1:30 p.m.
Ariel Quintela was selected to receive the Ybor Award for his dedication and passion for acquiring and preserving historic properties in Ybor City. He has taken on the challenge and cost of rehabilitating properties that have been severely neglected and has restored or is restoring them with great care and authenticity. As a nod to both his own Cuban heritage and Ybor City’s renown history related to Cuban independence, Mr. Quintela is naming some of his projects after Cuban patriots. Pizzo Award recipient, Stephen M. Barbas, is respected attorney who has demonstrated his pride and passion for preserving Ybor City’s history and heritage. With deep roots in Ybor that began with his grandparents, Mr. Barbas has invested in the Ybor community both in business and philanthropically as demonstrated by the eight years he served on the YCMS Trustee Board, including two terms as Chair. Mr. Barbas continues community engagement as a Ybor City Development Corporation Board member. Stephanie Agliano, who will receive the Adela Gonzmart Award, grew up appreciating her family’s heritage and legacy in Ybor City and Tampa as a fourth-generation member. Throughout her career and while serving innumerable boards and organizations, Stephanie has kept Ybor City as a part of everything she has done. She has generously contributed her time and talents to the YCMS, YCDC, Ybor Chamber of Commerce, and Historic Streetcar boards, among others. Lissette Campos, Director of Community Affairs for WFTS TV ABC Action News and the 2016 recipient of the Pizzo Award, will serve as Mistress of Ceremony. Admission is $65 per person and discounted admission for YCMS is $55. Reservations are required and can be made at YborMuseum.org/Legacy-Awards. For more information call (813) 247-1434 or email RSVP@YborMuseum.org.